The Telus Basketball Classic is largest and most prestigious high school and community basketball tournament in B.C., if not Canada. It was founded in 2000 by Howard Kelsey and a small group of very dedicated basketball supporters. Held at various venues in the Lower Mainland, the finals take place at the War Memorial Gymnasium at U.B.C. One of the significant features of the tournament is the awarding of many scholarships to graduating seniors. Among these is the Quinn Keast Foundation "Most Complete Player" Award and Scholarship. The recipient, selected from the Senior Boys and Senior Girls Division, is presented with the QKF Left Shoe Trophy. Taylor is in his third year on the Burnaby South Senior basketball team. Through hard work, discipline and self-sacrifice, he constantly makes his teammates and the team better. Last season, Taylor averaged 21 points and 4 assists in the playoffs, but more importantly, off the court, Taylor has lead over 500 kids in basketball clinics each year. His coach writes, "the tenacity of Taylor's effort, along with his leadership, determination and selflessness will be the substance that allows the team to maximize its potential." Taylor is consistently asked to defend top players, usually holding them to below their game averages. Abby was the starting point guard for the U17 Provincial Team and was selected as one of the ten best players in Canada for her age group by the U17 Canadian National Championship All-Star Committee. Head coach Scott Palmer describes Abby as a “quiet, determined leader-type who does her talking on the court…every team in the province would love her running their point.” Abby has always had a calming influence on the floor, managing the ball, her game, and the floor with an assured calm demeanor. She is always asked to defend her opponent’s best guard. Abby will continue her basketball career at Queen’s University in 2013. Cam Smythe was chosen as the most complete player at the newly renamed 2011 Telus Basketball Classic in December, 2011. Jeff Gourlay, Cam’s coach at Sir Charles Tupper Secondary School in Vancouver, had coached Quinn on the BC U-16 team in the summer of 2004. Coach Gourlay tells his Tupper Tigers: “That’s how hard you have to work if you want to go to the next level, watch Quinn Keast! Watch Keast compete, every possession”. Cam became a huge part of Tupper’s winning tradition in his 4 years of senior basketball. The Tigers were named the Most Inspirational Team at the BC AAA finals two years running. It was Cameron’s athleticism, his attitude and his competitiveness that led his team to strive to be the best. Cam is active in his community and always takes the time to talk to the kids who look up to him more than just literally. Like Quinn, Cam was not a showy player, was not prone to theatrics. He went about the business of trying to lead his team and be the best he could be with quiet but fierce determination. He was a worthy recipient of the Shoe Trophy and scholarship. 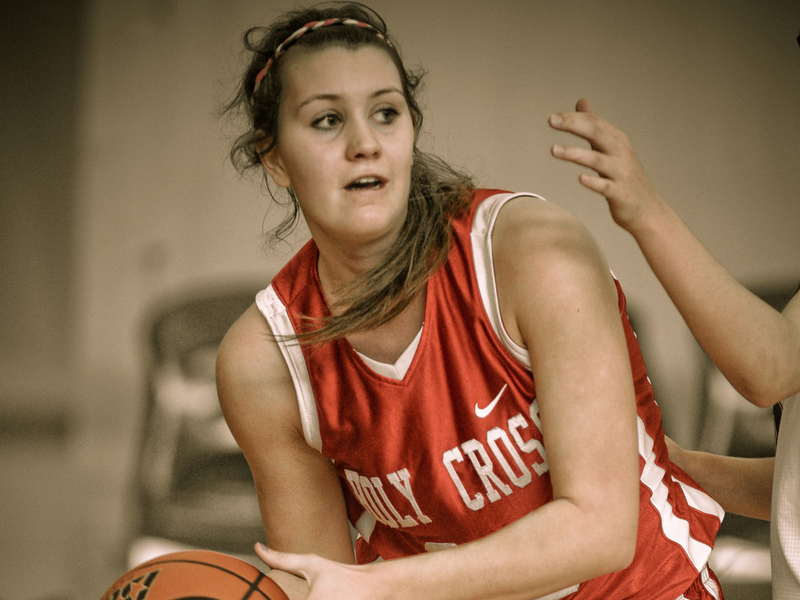 Tessa played senior basketball from Grade 9 through 12 and captained the AA Crusaders for her last three years there. As a top student and athlete she took her work ethic and dedication into the community where she coached and counselled. But it is her '˜heart' which proved an example for teammates as she inspired those around her to be better individually and as a team. Tessa played for B.C., developing the skills to play at any position and the desire to do whatever was needed by the team. In September, 2009, she underwent surgery to remove a cancerous brain tumour after which she endured radiation treatments. Even though the treatments caused a severe physical toll, including deafness in one ear and double-vision requiring one eye to be covered, she set about training and recovery so that she could participate in the 2009-10 season. Like Quinn, what Tessa lacked in height, quickness or leaping ability she made up for in heart, determination and perseverance. Tessa was also awarded the Gil Puder Memorial Award at the 2010 HSBC Basketball Classic as the Most Exemplary Citizen. James led Tupper, a AA-size school, from obscurity to the main stage of AAA boys' high school basketball in 2009-2010 beginning with the HSBC Basketball Classic. James led his teammates in pursuing the team mantra of "Every Possession" while recording 8 triple doubles in his Grade 11 year. He willed himself to become a "lockdown" defensive specialist in order to complete his game. In addition to his basketball excellence he has an outstanding academic record and is described by his coach as a '˜poster boy' for the concept of student athlete. Rounding out his high school years were countless volunteer hours spent helping others achieve their goals. Chantelle is a very hard worker on and off the court, working hard off the court on strength and conditioning and leading her team on the court from the point guard position. As a 4-year senior player, she worked tirelessly on her skills in order to become a better player. She was a co-captain of the Orcas in her senior year and a key member of both the 2007 and 2008 AAA Girls Provincial Champion. She earned the greatest vote of confidence from a coach when asked to defend the opposition's top player: "She has always been a '˜team player' first and understands when her individual talents are required in important game situations." Chantelle has played for British Columbia and maintained Honour Role status throughout her high school years. She is a complete player. "Akeem brings to the court an intensity I have rarely seen at any level and his work ethic and drive are a major reason for his success. His BC U17 Provincial team coach, Del Komarniski, commented that Akeem consistently outplays bigger and more skillful players simply because he works harder and plays with more intensity. Akeem is also actively involved in the Basketball Canada Centre for Performance where the coaches consistently use his attitude and drive as an outstanding example for the younger players to follow. Akeem is a complete player who always puts the interests of the team above any of his own. Akeem is 100% dedicated to our team's success and it makes no difference to him who gets the credit." In 2006-2007 Akeem co-captained his R.C. Palmer team as a Grade 11 and led them to their best finish in school history. He was an HSBC all-star and the MVP of both the Richmond and Lower Mainland Tournaments, both won by Palmer. In that season he averaged 12 rebounds per game and in the playoffs he averaged an amazing 17.5 rebounds per game! This was on top of 17 ppg 4.5 apg. Kristen is a total team player, always concerned for her teammates on and off the court. She played more minutes as a Grade 11 on the senior team than anyone else because she was the second leading scorer and extremely tough defensively. She trained hard and was relentlessly focussed on her game. She demonstrated exemplary sportsmanship and respect for everyone involved, from coaches to teammates, to referees to opposing players and game staff while maintaining outstanding academic performance. Kristen was also selected for the combined B.C. universities 4-year, full tuition scholarship at the HSBC Basketball Classic providing clear recognition by CIS coaches of her '˜complete game'.